You may not consciously know it, but it stands to reason: babies are more susceptible to the negative effects of pesticides and other harmful chemicals. An infant’s immune system is far less developed than that of an adult. As a result, they are not able to eliminate or deal with pesticides and their bodies may be affected. Exposure to pesticides in food can cause children to develop neurological problems, cancer, brain tumors, learning disabilities, and more. Since babies consume a lot more food relative to their body weight to meet the demands of their growing bodies, they will actually be consuming more pesticides than the average adult if they are consuming tainted food. You can make sure that your baby is getting the best food possible by opting for organic, pesticide-free formulas and foods. The only way you can avoid pesticides in your child’s food is to educate yourself on the topic and purchase foods that are confirmed to be free of pesticides and other harmful chemicals. That way, you can not only cut out the pesticides entering your child’s body but also make sure that they are getting healthy and healthful nutrition with the best organic baby formulas on the market. Read on to see the top five organic baby formulas out there. Earth’s Best Organic Infant Formula gives your baby everything that they need for the first twelve months. Great used on its own or as a supplement to breast milk, the ration of whey to casein in Earth’s Best is almost exactly the same as breast milk. It contains vitamins, minerals, protein, essential fatty acids, carbohydrates, and organic lactose glucose solids. The fatty acids are the same as those found in breast milk, with Omega-3 DHA and Omega-6 ARA fatty acids that are crucial for a baby’s mental and visual development. In addition, Earth’s Best Organic Infant Formula is easy to digest and is kosher and USDA Organic certified, so you know you’re getting the very best. Earth’s Best is also free of preservatives, GEI, antibiotics, steroids, growth hormones, artificial colors and flavors, as well as free of pesticides and herbicides, so you can feed your baby worry free. The added iron helps this formula meet the requirements of the FDA for a nutritionally complete package that helps to keep your baby strong. This formula has everything that you need in order to help fed your infant for their first year! Similac Advance Infant Formula with Iron, Stage 1 Powder offers complete nutrition for the first twelve months of your baby’s life. The Similac Advance Infant Formula features OptiGRO, which is an exclusively designed blend of the same ingredients that are found in breast milk. 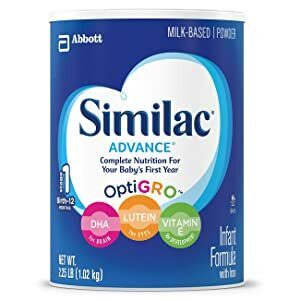 Filled with plenty of DHA and Lutein as well as Vitamin E to promote brain and cell development as well as eye development, Similac Advance Infant Formula with Iron, Stage 1 Powder provides all the nutrition that a baby requires for their first year. While not expressly organic, this milk based formula will give your child all the nutrition that they need to grow and is a great brand to go to when you have run out of options and feeding with breast milk is not working. This Vermont based infant formula is soy based and is a vegetarian source of protein for your child. This soy formula is certified to be organic and meets the regulations of the USDA and the FDA. It is officially milk and lactose free as well as free of gluten, and is certified kosher and to be made with ingredients that are non-GMO. It contains to pesticides and is one of the best formulas out there for complete nutrition for your baby. This milk and lactose-free formula is also ideal for children with sensitivities to lactose. Additionally, it contains nutrients that are there in breast milk, like choline, DHA, and ARA, to support healthy development. 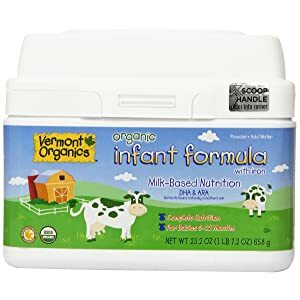 Vermont Organics Milk-Based Organic Infant Formula also contains iron fortification, vitamins, minerals, and a variety of nutrients that will help to develop and protect their immune system. This healthy soy based formula is manufactured in the U.S. just north of Burlington, Vermont, so you can rest knowing that this formula is not only healthy for your baby but locally sourced as well. Made with minimal processing involved and natural ingredients that are extracted from products instead of being man made, there are no ingredients in this formula that are on the Banned Ingredients list. The Vermont Organics formula is produced in accordance with USDA regulations and contains no pesticides, antibiotics, or growth hormones. Just mix it up with some water and meal time is ready, without any adverse lactose reactions for sensitive babies. Some people who have tried this product have raved about it, while others have ditched it complaining of metallic scents and their children refusing it, so keep that in mind if you decide to try it out. Toddler Form is one of the best organic baby formulas on the market! It is iron fortified and certified USDA organic. It is also lactose free, perfect for babies who have a sensitivity to lactose or dairy. The Toddler Form Organic by Baby’s Only was developed specifically to meet the guidelines set out by the Academy of Pediatrics. It makes the Pure 10 Pledge that ingredients used are only organic, purified, and non GMO. 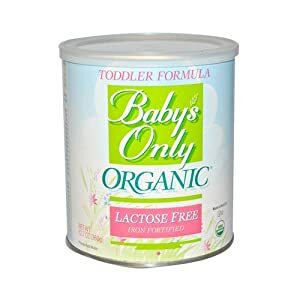 With no glucose or corn syrups included, the Baby’s Only Organic Dairy Toddler Form one of the best organic baby formulason the market. All of its ingredients are organic compliant and this formula contains Linoleic and Alpha Linoleic Fatty Acid to meet your baby’s developmental needs. Best of all, enjoy a formula that is guaranteed to have no algal D.H.A. that is processed in unhealthy and toxic methods. This product isn’t just for toddlers– babies can consume it too. That’s just part of the title. This milk based infant formula with iron is Gerber’s powdered formula for babies that are in stage 2 of their lives from 9 to 24 months old. This handy powdered formula is easily mixed with water for a quick meal for your baby, and contains A.R.A., D.H.A., F.O.S. and calcium to give your child what they need for their growing body. It contains ingredients contained naturally in breast milk, and a blend of nutrients that support growth and development, including prebiotics for the immune system. 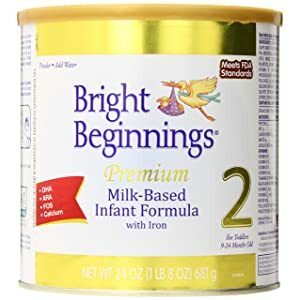 The Bright Beginnings Stage 2 Baby Formula is a good addition to a semi-solid diet that includes other types of baby food. This formula was developed specifically to meet the nutritional and developmental needs of older infants and toddlers. Best of all, their ingredients are derived from all vegetarian sources. There are many types of organic baby formulas out there, but mostly the difference comes down to whether it’s organic and if there are certain ingredients in one that aren’t in the other. The majority of organic baby formulas come in powdered form, whether milk based or not, and are mixed with water to create an instant snack in a bottle. They are either basic powdered or concentrated powdered formula. There also are liquid organic formulas available out there, called “ready to use” formulas. These require no mixing but are more expensive overall. The quest for the best organic baby formula is probably one of the most difficult tasks of being a parent as a consequence of being suddenly placed in a position that you need to do tons of research and study to pick which among the brands is the best formula for your child. Bright Beginnings Baby Formula has the recommended nutritional values and vitamins which are needed for a developing baby. Bright Beginnings Baby Formula have the right amount of protein in the right ration and a good amount of amino acids which is tailor made to fit exactly as your baby needs. Bright Beginnings Baby Formula has easy to digest organic formulation for young babies. Natures One has full dedication to producing no chemical residue in their formulas or any by products. Natures One baby formula does not contain cyauric acid or melamine which is commonly found in common household items. Natures One provides a lot of choices for organic baby formula such as soy, lactose intolerant, dairy, and many other choices. Natures One has the recommended carbohydrates and proteins ratio for the growing baby. Vermont Organics is an organic baby formula that is made without artificial growth hormones, chemicals, and pesticides. Vermont Organics is especially blended with the recommended protein and vitamin levels that are required in infant formulas. Vermont Organics features DHA and ARA in their formulation, which are important for your baby’s brain development and are not present in other organic baby formula brands. Vermont Organics have soy and dairy blends which are gluten free. Vermont Organics has a soy blend which is perfect for a lactose intolerant child. Similac’s organic baby formula has an organic dairy blend that easily mixes and provides nutrients for a growing baby. Similac is packed with antioxidants and has a good mix of DHA and ARA for healthy brain growth. Earth’s Best Organic formula provides the crucial vitamins that a growing baby needs. Earth’s Best Organic has no steroids, growth hormones, or pesticides that can be found in non-organic baby formulas. 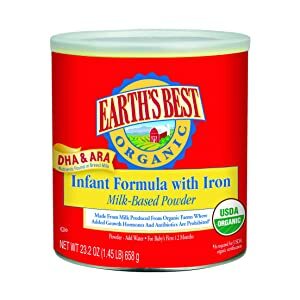 Earth’s Best Organic offers a couple of choices for the best organic baby formula for your child, namely: soy formula with DHA and ARA and organic dairy formula with DHA and ARA. There you have it, a compiled list of what the best organic baby formula brands has to offer. It is up to you, the parent, to choose which formula is the right fit for your child. Feeding your baby organic baby formula means choosing to give them the gift of living a healthier life at an early age. Organic baby formula is produced without the use of growth hormones, synthetic pesticides, or potentially harmful chemicals. For a few months after their birth, babies receive most of their nutritional needs from breast milk or baby formula. It is of utmost importance then that these baby formulas contain only the safest ingredients. If taken orally, heavy metals or potential toxic chemicals can cause a lot of health problems, like an impaired immune system development. Also, young babies consume excessively high levels of vegetables and fruits as compared to adults. This fact increases their risk of contact to potential contaminants which is found in non-organic products. Organic baby formula does not contain GEIs or genetically engineered ingredients, which are made by inserting genes from one plant to a strain of another plant to produce more harvest or to control pests. The simple and pure reason for choosing organic formula as the best baby formula for your child means that you are taking a proactive role in choosing an option that is better for you, better for your baby, and better for the environment your baby will grow up in. contain no GEIs or Genetically Engineered Ingredients. are made only from whole grains. has no modified starches, added salt, or refined sugars. has no artificial colors, flavors, or preservatives. have undergone rigorous product testing. have organic ingredients grown without the use of harmful pesticides. While we agree that breastfeeding is a wonderful, healthy, easy, inexpensive, natural, and rewarding way of feeding your baby, there are times when even the most dedicated, good, caring, nurturing, loving mothers experience problems breastfeeding their babies to the point that it impedes their bonding with their babies. In cases like this, the best thing you can do for your baby is to choose to give them the best baby formula there is, and that is organic baby formula. In today’s world, most of our foods, hygiene care products, beauty products, and even household products are laden with chemicals and additives which are not only harmful to the environment, but more so for our health. Countless studies have shown that artificial compounds added to the foods we consume are directly linked to the proliferation of diseases and disorders like heart disease, certain types of cancer, and diabetes. If our health as adults can be affected in such a profound degree by artificial additives, then what more about the health of our children, especially the very young infants? It is not a surprise then that breastfeeding has been advocated as the primary source of infant nutrition, but then, numerous factors can affect a woman’s ability to breastfeed. More so, if the mother eats foods laden with chemicals and additives and uses products that are tainted with harmful synthetic materials, then it can be transferred to her baby through breast milk. Feeding your infant with baby formula may not be the answer unless you choose an organic baby formula. In instances wherein breastfeeding may not be the best option for your baby, finding the best baby formula to feed your child with can be a difficult task especially when you have to think about the pros and cons of non-organic and organic. Choosing to feed your infant with organic baby formula is one of the best things you can do as a parent. This way has many benefits which cannot be found in non-organic formulas such as the fact that organic baby formula has nil to only a few potential future allergens, making it very safe for your baby. A baby has a very immature body which is still developing. In the first few months of your baby’s life, he or she is still developing his or her digestive system, eyesight, and are growing his or her bones and body. It is why it is of utmost importance to choose to give your baby organic baby formula and the best organic baby formula that you can find during this vulnerable period. Choosing the best organic baby formula means choosing to feed your baby toxin-and-harmful-additives-free best formula for your baby to prevent any harm to his or her development. The best organic baby formulas have additional nutrients which is formulated to be safe for your baby unlike conventional or regular baby formulas. These brands have added supplements present in them like ARA, DHA, and iron which are either plant-based or milk-based and are not from synthetic sources like those in regular baby formulas, making them the optimum choice for your baby. With those things said, it is fairly obvious why going this route is necessary for your baby and his or her well-being. Given the range of available brands in the market today, you should not have any problem finding the best organic baby formula to meet your baby’s health and nutritional needs. In the end, choosing the best organic baby formula is all about what works best for you and what types of ingredients you do or do not want. The market research varies, with some claiming that some ingredients are bad and others, not so much. Conventional baby formula that is not organic may contain GMO corn as well as GMO soy, and be contaminated with a lot of nasty ingredients, including potentially pesticides, herbicides, synthetic vitamins and minerals, bad fats, processors, and chemicals. Conventional formulas don’t have nay beneficial bacteria, lack enzymes, preservatives, have unhealthy fats and even processed and refined sugars as well as neurotoxins. These are the types of formulas you want to avoid. Many parents prefer to avoid these processed and refined sugars, which include glucose syrup solids(corn syrup), maltodextrin, and brown rice sugar or rice syrup. While it can make formula taste more appealing, it’s not always the healthiest ingredient for baby formula but has largely replaced lactose as a cheaper alternative. You may also want to avoid palm oil in formula, which can be added in order to mimic natural milk but can form into soaps in the baby’s intestines and cause issues such as lower bone mass and harder stool. Certain types of D.H.A. and A.R.A. may be problematic as well if they are extracted from C. Cohnii and M. Alpina, factory produced stains of algae as well as fungus that are not part of a natural human diet. These ingredients may cause vomiting, diarrhea, and other digestive problems as well as larger problems if these ingredients were extracted using the neurotoxic hexane, a petroleum based solvent. Parents may also choose to avoid synthetic preservatives, which may be present in the form of ascorbic palmitate and beta carotene to protect the oils in them from going bad. It’s probably a good idea to give these ingredients a berth if you’re highly conscious of ingredients. Synthetic nutrients have also been rejected by the N.O.S.B. and are not requirements for formula. They include lutein, nucleotides, l-carnitine, l-methionine, lycopene and taurine. These ingredients in conventional formulas may be toxic or contain traces of herbicides, pesticides, or other hazardous agents. Synthetic ingredients should be viewed with caution. What are the benefits of going with a certified organic formula? Companies that are certified organic have to use ingredients and create formula that is entirely organic and cannot be grown with pesticides, petroleum based fertilizers, genetic engineering, or ionizing radiation. Any ingredients used from cows have to be organically fed and raised without growth hormone or antibiotics and have access to being outdoors as well as pass inspection by a certifier that ensures the guidelines are followed. Choosing the best organic baby formula is easy once you eliminate the low-quality formulas out there. As a parent, whether you made the choice to use formula before your child was born, chose to use formula as a supplemental along the way or even had to because you weren’t producing enough milk, you want to choose the best organic baby formula for your child to further their development. It’s up to you to do your own research and see what the most advantageous formula would be for your baby. Many babies have different reactions to different formulas in part because of their ingredients. If you think your baby might have allergic reactions or adverse reactions to certain ingredients like glucose or lactose, consult your pediatrician to see which organic formula might be the best for your child. Until your child is about 6 months old, breast milk or formula will take care of breakfast, lunch, dinner, snacks, and those middle-of-the-night wake-up calls. That’s all your baby needs to grow healthy and strong. Then you can begin adding so-called solid food to the mix–continuing to breast-feed and/or supplement it with formula–until your baby’s first birthday or so, when cow’s milk becomes an option. Do your research, see what’s out there, and consider what works best for you and your child. The best organic baby formula is the one that meets your baby’s needs and keeps them healthy and happy, so avoid formulas with chemicals and additives and give them only the best.